From the Chair of Journalism Innovation, S.I. Newhouse School. My goal at CES was to find some new technologies that impact media for my New Tech for New Media class to explore in February. 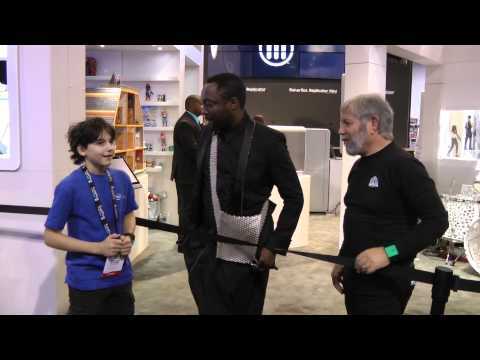 While I agree with people like Jack Myers that there were no truly innovative breakthrough technologies at this year’s show, I found a few unique offerings that fit into the themes of this year’s class, which is focusing on “wearable, waveable and flyable” technologies. In some cases I was also able to post quick video interviews from Google Glass, which proved to be an effective way to get the attention of people manning popular booths. I experimented both with capturing video and one-tap uploading into YouTube. This proved to be a good way to cover a breaking event, with instant videos going online that I could later edit and annotate in the YouTube interface from my hotel room each evening. Displair, a touch screen made of air. 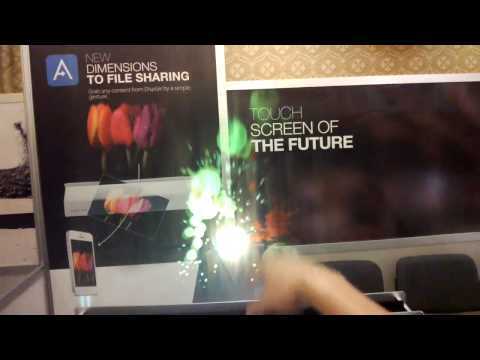 The Displair touch “screen” consists of a printer-sized device that shoots a jet of water vapor upward to create a shimmering surface that is then projected onto from a few feet away. Sensors in the device can tell where your hands are in physical space, so it also works as a touch screen. Here’s a video of me playing Fruit Ninja in the air. I could see this being useful for interactive advertising in retail locations, as well as media/art installations in museums and other public spaces. 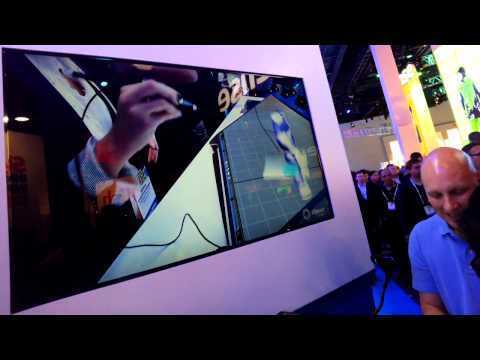 Intel’s booth featured a demo from a company called Zspace that pairs passive 3D glasses with a screen and pen. You use the pen to manipulate virtual objects that appear to float in the air right in front of you. While I wasn’t able to try it myself, the people going through the demo seemed to be really engaged. A 2D screen above them showed roughly what they were seeing. 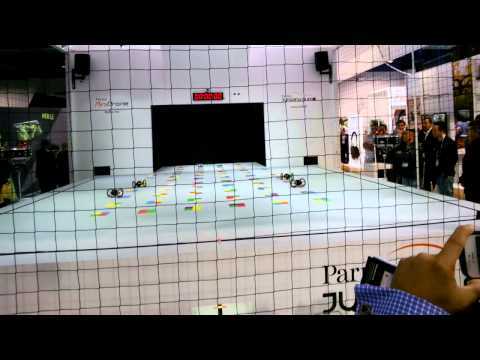 Here’s a video of a demo I captured from Google Glass. This inexpensive wearable camera takes pictures all day long. You clip it onto your shirt or jacket, open the shutter and forget about it. It takes photos all day long based on an algorithm that uses changes in light, motion, direction and temperature to determine when to take a shot. 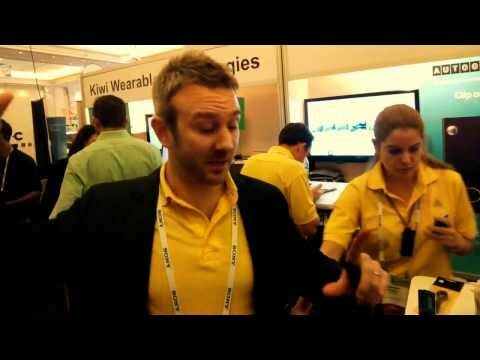 Here’s a quick Glass interview with Autographer’s marketing director James Ebdon. My thoughts on how this could be used in journalism and media: just as Google Glass is helping journalists capture photos that they would have missed in the 15 seconds it takes to pull out a traditional camera or cell phone, this could be another useful tool in the arsenal of the mobile journalist. But it also has obvious implications for privacy, ethics and even the law depending on what country or part of the world you’re in. Just because you can capture anything doesn’t mean that you’re allowed to use the footage. But what else is new? As soon as cameras moved into cell phones, humanity has been in the process of becoming one big camera. These days if you walk outside you should just assume your image is being recorded and posted somewhere, likely without your permission. I ran into this Indiegogo-funded startup in the hallway of the Venetian. At $400, Epiphany Eyewear is like an inexpensive alternative to Google Glass for people who want to record ambient video, but don’t need Glass’s augmented reality features. Like Autographer, it has some implications for privacy and ethics. I fully expect to get interviewed from “social glasses” like this sometime in the future, and you should too. Of course, there were plenty of innovations that had nothing to do with media, but may some day. Here are a few other innovations that caught my eye. As an outspoken proponent of drone journalism, the only reason I categorize these new A.R. Parrot drones as “beyond media” is because the flying version has no camera, and I’m having a hard time imagining a common media use for the land-based sumo. But they sure were a lot of fun to watch, and it was incredible to see how synchronized the drones were. After explaining this technology to studens in my Next News Startup class, one of them (that’s you, DJ Summers), made what I think is a prescient prediction. Just as companies like Wal-mart disrupted the retail business, and Amazon is now disrupting bricks and mortar retail and is looking to technologies like drones to reduce delivery times from days to hours, 3D printing technology could disrupt package delivery. In the future, how many items that we now order online with Amazon Prime free shipping will we simply print off or replicate in our homes? At the IRTS Faculty Seminar I attended right before CES, Hunter Lloyd from Montana State University’s computer science department showed just how far consumer robotics has come along. They’ve long since moved on from vacuuming the house and are now emerging as companions with good dance moves to boot. Here’s the Nao robot he programmed. 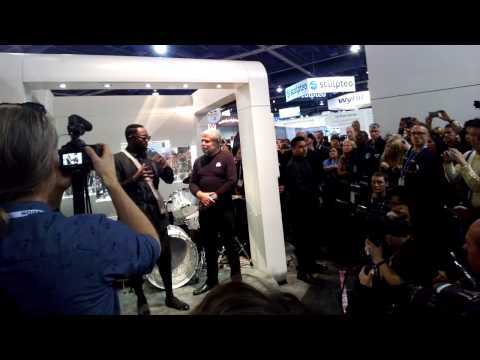 No, Will.i.am isn’t selling himself as a robot yet, but he is getting into 3D printing. 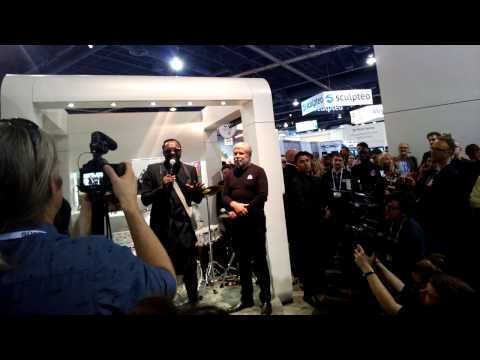 Somehow I just happened to be at the 3D Systems booth when Will.i.am announced he was becoming the creative officer for 3D Systems. I captured these two videos. I had a lucky break when he called out 13-year-old “young maker” Schuyler St. Leger, who was in attendance and happened to be standing right in front of me when Will.i.am called him out of the crowd. I did some research on St. Leger and found out that he’s quite the Internet celebrity and has even done his own Ignite Spark on why he loves his 3D printer. This is the digital home of Dan Pacheco, Chair of Journalism Innovation at the S.I. Newhouse School at Syracuse University. Learn more about Professor Pacheco. Pacheco in the Press: See recent mentions and quotes from Professor Pacheco in the press. Schedule Time: Check Professor Pacheco's office hours or request a different time through Doodle. Send Prof. Pacheco a message through this online form.